The closure of slurry impoundments utilizing push-outs of coarse coal refuse (CCR) from the perimeter of the impoundment can lead to difficult to predict major heaving of the fine coal refuse (FCR) in the impoundment. D'Appolonia is experienced in developing modifications to closure plans to accommodate such heaving. 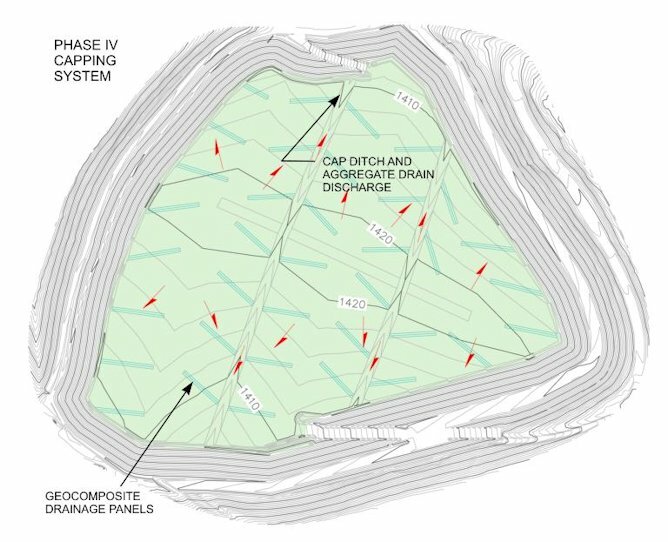 Modifications may include alterations to the drainage system including increasing pumping capabilities, design of containment berms, and modification of the final grading plan to accommodate the altered geometry resulting from heaving. Capping system developed by D'Appolonia as part of closure plan for slurry impoundment affected by heaving. D'Appolonia prepared the design and permitting submittals for the construction and operation of a 75-acre coal refuse slurry impoundment for a two-million-ton-per-year coal preparation plant in Southeastern Ohio. At the end of the operational life of the facility, we prepared reclamation plans for closure including dewatering, regrading, capping and covering the coal refuse impoundment after mining operations had ceased. D’Appolonia provided engineering services related to the closure of a coal refuse disposal impoundment. The impoundment had received 5 to 7 million tons per year of fine coal refuse (FCR) slurry from the site preparation plant over a 30-year service life. Heaving of the solidified slurry was at first less than expected, but subsequently increased dramatically. D'Appolonia developed a revised closure plan that involved decommissioning of the decant system and implementation of a pumping plan, developed a phased plan with berms to contain the fine coal refuse (FCR) and provide storage for storm events, and prepared a final grading plan to accommodate the increased levels of FCR.